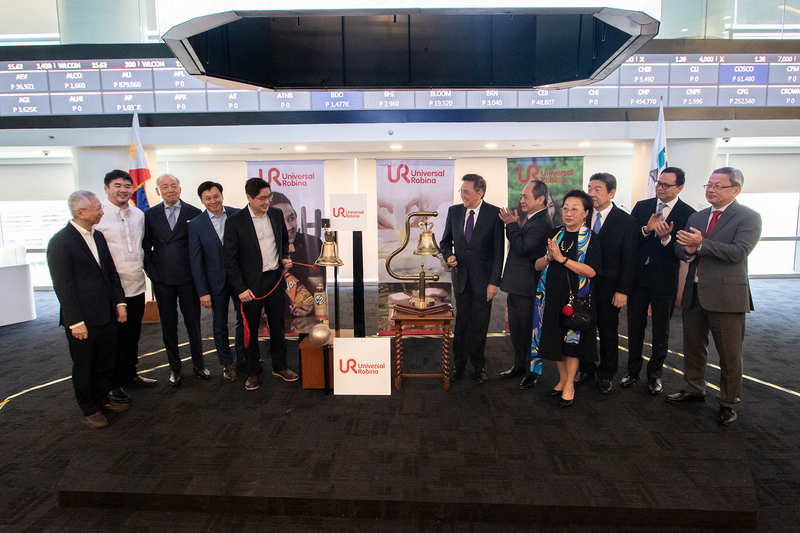 Universal Robina Corporation (URC) commemorated its silver listing anniversary with a special bell ringing ceremony at the Philippine Stock Exchange (PSE) on Monday. “URC's market capitalization soared to Php328.9 billion (on March 22, 2019) from Php8.35 billion pesos on its listing day. It has also been a constituent of the PSE index for more than half its life as a listed company. This is a testament to how the market values the stock, which in turn is a reflection of how the company is managed and operated,” said PSE Chairman Jose T. Pardo in his welcome remarks during the event. Shown in the photo (from left): JG Summit Independent Director Antonio L. Go; URC Director Patrick Henry C. Go; URC Director Robert G. Coyiuto, Jr.; URC President and CEO Irwin C. Lee; URC Chairman Lance Y. Gokongwei; PSE Chairman Jose T. Pardo; PSE President and CEO Ramon S. Monzon; PSE Directors Ma. Vivian Yuchengco, Wilson L. Sy, Emmanuel O. Bautista and Alejandro T. Yu.